Mechanical clocks are now considered works or art, a part of history, a part of the family and they also need love. Sooner or later, your treasured time piece will stop. Your choice is to either live with it in silence or go to a hard to find clock repair shop, leave it for weeks and pay perhaps hundreds of dollars to get it back, hopefully working. Fact is, you can more than likely do the same thing they do, by yourself. There are little known items that stop a clock that you can easily do yourself for little or no money. You can even oil your clock for just a few dollars worth of oil. You can service any mechanical pendulum clock: Grandfather Clocks, Mantel Clocks, Wall Clocks, Kitchen Clocks, French Clocks, Cuckoo Clocks, etc. No special tools needed besides oil which I will tell you where to buy very inexpensively. I will teach you how to service your own clock. I will take you from winding your clock correctly all the way to restoring vintage clocks. I teach a clock repair class for beginners. I use this book as my class work book. I have included all the common student mistakes and answered all the common questions. This latest bound Edition is packed with all the skills and repair techniques needed to repair and restore your old Clock. The eBook is the same full book, but sent as a pdf download in full color. No shipping cost and fast arrival. 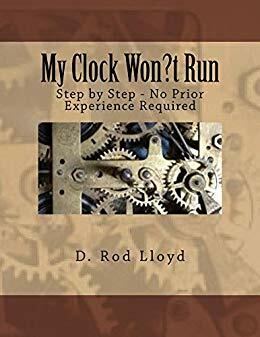 The Basic Edition is an earlier bound version of this book suited to basic, simple repairing and oiling old clocks. I just wanted to thank you once again. I thoroughly enjoyed the clock class this recent weekend, and learned a great deal. I'm excited and invigorated to take my clock work further, and appreciate your insight and instruction throughout the class. I look forward to staying in touch as I progress, and to likely seeing you an evening during your clock class once I have chosen one (of my many) projects. I will be in touch. I'm enjoying reading your book. I've already learned more in a couple days of reading than I learned the whole last term of clock class. The previous instructor had to quit teaching so early in the term. I was given specific directions from him, Steve, and Terry, regarding my specific time-only clock, but I did not really know why I was doing what I was doing. So, as you can imagine, I'm pretty enthusiastic about your teaching style and hope to learn a great deal from you! Thank you for taking the time and trouble to keep the clock class running. I enjoyed learning from you. I look forward to seeing you in the fall.